Today I am sharing one of the side dishes I made for Thanksgiving since my sister-in-law and cousin have both requested the recipe. 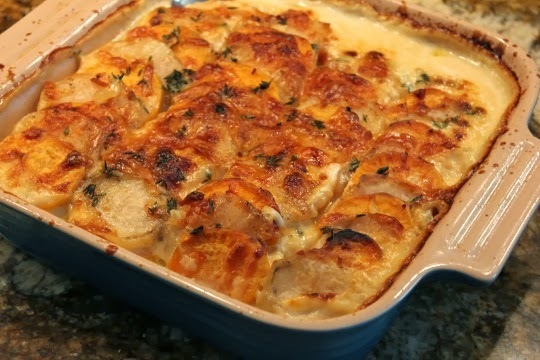 This is the second year I have made this cheesy potato dish - it's definitely a keeper! I thought about making a sweet potato mash this year, but in the end I opted for the Mixed Potato Gratin once again. It may just become a new tradition. Just make sure all of your slices are the same thickness so that the potatoes cook evenly. This potato dish is the perfect side any time of year. Using a mandolin, food processor or very sharp knife, cut them into 1/8-inch-thick rounds and place them in a bowl. In another medium sized bowl. combine the cream, garlic and thyme and set aside. Place 1/2 cup of the shredded gruyere cheese aside to use for the topping. Spray a 9x9 baking pan with cooking spray and layer the potatoes, alternating colors in 1 even layer. Sprinkle the top of this layer with some salt and pepper, a little bit of gruyere cheese and a little bit of parmesan cheese. Repeat this process until you use up all the potatoes. I had about 4 layers. Pour the heavy cream over the mixture once all your layers are done. Sprinkle the top with the remaining gruyere cheese and dot it with butter. Cover gratin tightly with foil and bake for 30 minutes. Remove the foil and bake for 25 minutes longer. Let it set for a few minutes before serving.